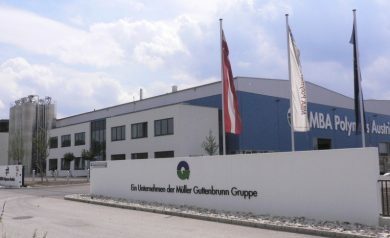 Effective July 1, MBA Polymers Austria will become a wholly-owned subsidiary of the Müller-Guttenbrunn Group. The plastic recycling plant in the Kematen business-park was founded at the end of 2004 as a joint venture between the American MBA Polymers Inc. and Müller-Guttenbrunn GmbH, the recycling facility was built in 2005 and the recycling plant has been in production since the beginning of 2006. With the change of ownership of the American partner, the Müller-Guttenbrunn Group suddenly had the surprising opportunity to take over the remaining shares in the Austrian MBA Polymers recycling plant in Kematen. „We took this opportunity immediately. The location in Kematen has developed magnificently over the last few years and we are convinced that the company is perfectly fit to suit to our strategic orientation, “ explains Christian Müller-Guttenbrunn, CEO of the Müller-Guttenbrunn Group. This plastic recycling plant in Kematen is one of the most advanced plastic processing plants in the world. Approximately 125 employees produce high-quality „Post-Consumer Recycled“ plastics (ABS, HIPS, PP and PC / ABS) from mainly E-Waste plastics. Recently major investments were made in a fourth extrusion line and in a new warehouse. The processing capacity of MBA Polymers Austria thus increased to over 50,000 tonnes per year.